Alam is a professor of electrical and computer engineering and has been at Purdue since 2004. His research and teaching focus on physics, simulation, characterization and technology of classical and novel semiconductor devices. 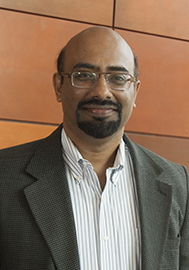 He has made fundamental contributions to, and innovative computational models for, spatially and temporally complex materials relevant for flexible electronics, solar cells and scaled transistors. He is a fellow of Institute of Electrical and Electronics Engineering, American Physical Society, and the American Association for the Advancement of Science. Alam received his bachelor's degree from Bangladesh University of Engineering and Technology and his master's degree from Clarkson University. He earned his doctorate at Purdue.